Our cloth diaper obsession continues with a new discovery of a great Canadian based company that manufactures a line of baby products. Not only have they mastered cloth diapers, they also have great clothing/layette, nice kids rain suits, wonderful bedding, and much more. Kushies sent us the new Ultra-Lite diaper and a Swim Diaper for review. Ease of use: The Ultra-Lite is an AIO diaper. There is no need to stuff it or put a cover on it. So when it comes to functionality, it's just like a disposable. It is extremely soft and has a separate layer that can be folded to suit both boys and girls where most absorption is needed. It was super easy to wash, though it takes longer to dry than pocket diapers, it's not a huge difference because one layer of it is sewn only at one end to speed up drying time. The swim diaper is even easier to use! That's because it dries in no time! if it isn't soiled you don't even have to put it in the wash, just a rinse will do the job. It has a thin terry lining and mesh to keep messes contained. It isnot waterproof since that wouldn't make sense for a swim diaper anyway. Quality & Value: Both the Ultra-Lite and the Swim Diaper are very well made. My only problem is with the velcro. Though it is the easiest and fastest way to fasten a diaper, it can also leave thread trails through your wash. Even when I fasten the tabs to avoid that, it happens sometimes anyway. It's not a big deal, just a preference. The price is right on these though! You can buy the Ultra-Lite for $12.49 infant size or $13.99 toddler size. That's a great price for an AIO! You save even more by buying trial packs. The swim diaper is $10.99, also a great price and since it is quite adjustable it will last more than one season. Fit & Design: For the Ultra-Lite we got the toddler size which starts at 22 lbs. Our daughter is barely 22 so it looks huge on her. As of now I can't fit any pants over the diaper so we use it at home. She just has to grow into it! But I can see that when she is a little bigger it would be a perfect fit. I love that it is contoured and the aplix closure really gives you custom adjustment. It's our first print diaper and I love it! The only thing is I wish it had a stay dry inner because my daughter gets rashes easily (hasn't happened with this one yet). It would be great if it also had an elastic back to keep messes in better. 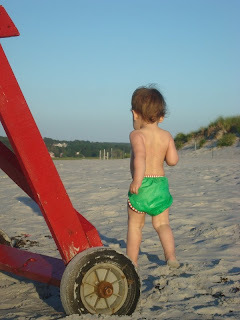 We got the smaller Swim Diaper with the intention of wearing it this summer. It fits perfectly. The only thing is that I have trouble putting it on her perfectly when we're already at the beach and she is running around like crazy, she doesn't like getting her swim diaper on! (as you can see in the photo) My favorite features are the leg gussets and the cute tie in the front. Who Would You Recommend this to? 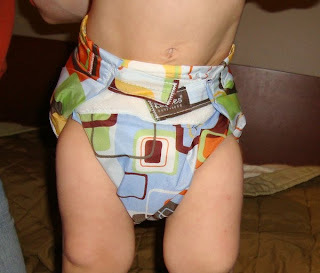 For anyone who wants to cloth diaper on a budget without compromising quality and ease of use! Well, for anyone really, the price is just a nice perk if you have oodles of money! This is a great choice if you want exceptional quality. Buy Kushies diapers at the Eco-Babyz boutique. 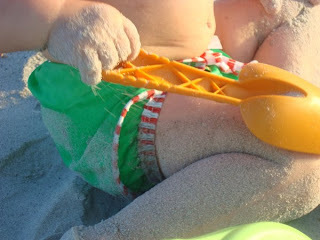 One Eco-Babyz reader will win a Kushies Swim Diaper in your choice of print/color! If you don't win, use code ecobabyz10 for 10% off any purchase at Kushies! MANDATORY ENTRY: Become a fan of Kushies on Facebook OR if you don't have a Facebook account, visit the Kushies website and tell us what you would love to have. Contest ends at 11:59pm EST on Friday, July 30th. The winner will be selected using Random.org on Saturday, July 31th and notified by email (make sure I have a way to get in touch with you, provide email in your comment if it is not in your Blogger profile). Open to 18+ US residents! Thank you! 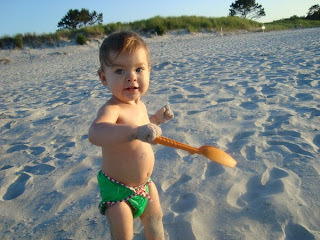 I'd LOVE to try the Girl's Swimsuit Diaper Solid Yellow on my little girl next summer (she's still in-utero). Thank you for this great giveaway!! MANDATORY: I'm a fan of Kushies on FB! I would choose the swimsuit diaper in solid yellow size large. i'm a fan of kushies on fb! i'm following you on fb! i would love to win the solid orange swim diaper. I would love to have training pants for my son. I like the Daisy Swimsuit Diaper Print. I Like Eco-Babyz on Facebook. I'm on the Kushies mailing list. I would love the Nursing Pillow in Green! I would choose the Solid Orange! Voted on TMB today (7/22)! Voted on TBB today (7/22)! Voted on PFB today (7/22)! I would get the solid orange Kushies swim diaper if I won. I would love the Safari Velour sleeper! I would pick the Gold Fish swim diaper. I voted on Top Mommy Blogs 7/26. I voted on Top Baby Blogs 7/26. I voted on We're on The Fence 7/26. I became a fan of Kushies on Facebook. I voted for you today at Top Mommy Blogs! I voted for you today at Top Baby Blogs! The Daisy print one is very, very cute!! I voted on Top Mommy Blogs today 7/27. I voted on Top Baby Blogs today 7/27. I voted on WOTF today 7/27. I would love to have the Infant Ultra Diaper - Family Print. I would choose the Swimsuit Diaper Print Gold Fish. I follow Kushies on twitter @mileerom. I joined the Kushies mailing list. 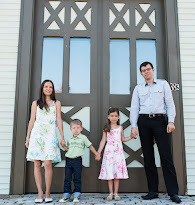 I voted for you on Top Mommy Blogs today 7/28. I voted for you on Top Baby Blogs today 7/28. I voted for you on WOFT today 7/28. I liked Kushies on FB.. I like the goldfish print on Kushies!! I like the Linki Chip Clip Together Teether & Toys. Became a fan of Kushies on FB. Joined the Kushies mailing list. I voted for you on Top Baby Blogs today, 7/30. I voted for you on Top Mommy Blogs today, 7/30. I voted for you on WOTF today, 7/30. The organic sleepers are so cool!!! I'd love the Swimsuit Diaper Print Daisy in size medium.